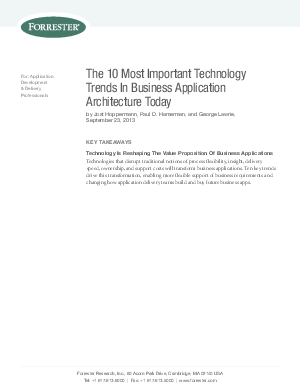 This report enumerates the top 10 technology trends that are reshaping the nature and value proposition of business applications today and in the coming years. Application delivery leaders, application architects, and enterprise architects should use this report to inform their application strategy. The report will help them define their road map for implementing that strategy and avoid basing their long-term strategy on the technologies or architectures of the past, as these are inherently ill-suited to meeting the challenges of the coming decade.